Welcome to our "Easter Bender" edition. With each week, the number of events just keeps growing. Did anyone check out last week's Make It! craft show? If you missed it, check out their Flickr page to see how it went and what kind of neat things are sold -- and think about attending the next one. Now with the long weekend fast approaching, we have one important question: what will you be doing with your extra time? If you're looking for ideas, we've got a ton of new events to share. Enjoy. WANT TO BEE on the COOLEST LIST in TOWN? Sign up for our FREE BEE VANCITY newsletter --> CLICK HERE! 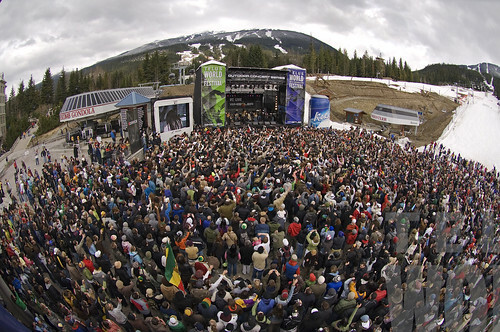 Apr 21-24| Whistler| Concerts FREE! It's outside Vancouver, we know, but there are some amazing bands playing for free in Whistler this week! On Thursday, Black Mountain, Tokyo Police Club (whose show in Vancouver Saturday night is sold out) and Darker the Sky will be performing. Friday shows feature Broken Social Scene and Dinosaur Bones, and Saturday wraps up with Marianas Trench and the Ghetto Funk Canada Showcase providing the soundtrack to the Big Air competition. On Sunday, a bonus with Ozomatli and KO Now. If that's not a good reason to get out of Vancouver, I don't know what is. Apr 22 | 11-3pm| Broadway Skytrain Station| FREE! Get ready for "the most fun you ever had saving the planet"! This is Vancouver’s first Earth Day Celebration organized by youth for everyone to enjoy. They hope to raise awareness and show common concern about the effects of climate change. --> Thx Andrea Curtis, Ben West and the high school youth! Also, join or watch the superhero flash mob! We're all superheros and we have the power to vote! Help rescue Canada from voter apathy! --> Thx Emily J, Masala Bee and the Get Your Vote On team.